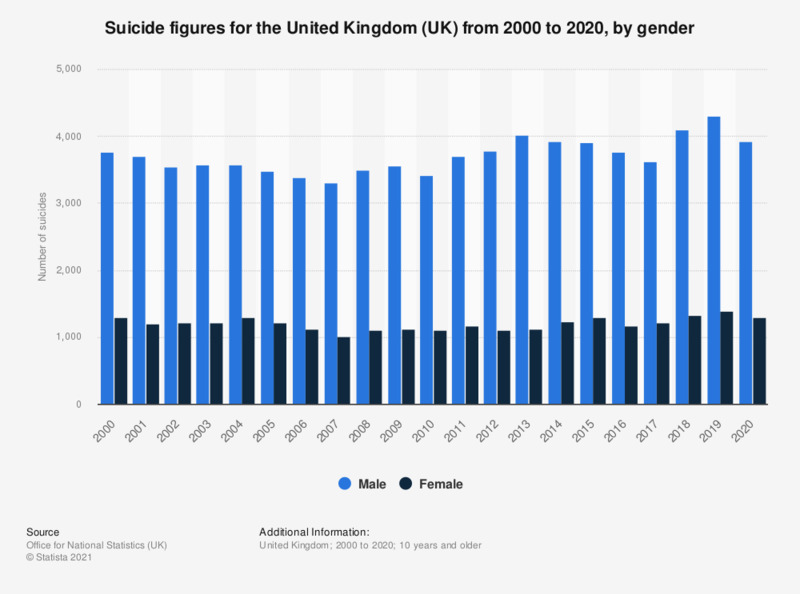 This statistic shows the suicide figures for the United Kingdom (UK) from 2000 to 2017, by gender. In this period there were substantially more suicides among the male population than the female. In 2017, the number of suicides among males amounted to 4,382. In the last few days a lot has been said about the "Blue Whale", a "game" born in Russia and which led various teenagers to suicide. Before the service broadcast by "Le Iene", had you ever heard about it? According to you, in general what does push teenagers to undertake the kind of games which lead to suicide or to physical harm? What are the triggering factors? According to your experience, are young teens nowadays more vulnerable and easy to “be lured "? Is there a greater risk for them to be involved in phenomena of online suicide/self-harm games? According to you, to which extent are Internet and social media responsible for the diffusion of the phenomenon of games leading to suicide or physical harm?